Pittsburgh Underground: Comics To ROT Your Brain: The F1RST Hero: Fight For Your Life Kickstarter Campaign Starts TODAY!!! Comics To ROT Your Brain: The F1RST Hero: Fight For Your Life Kickstarter Campaign Starts TODAY!!! Greetings once again loyal viewers! Our old pals residing in the Great White North are at it again and they need your help! The Toronto duo of writer ANTHONY RUTTGAIZER and artist DANNY ZABBAL have, this morning, launched a month-long fundraising campaign via the website Kickstarter to help cover the costs of producing their new comic book series, THE F1RST HERO: FIGHT FOR YOUR LIFE. Check out this clip from our pal Anthony Ruttgaizer! 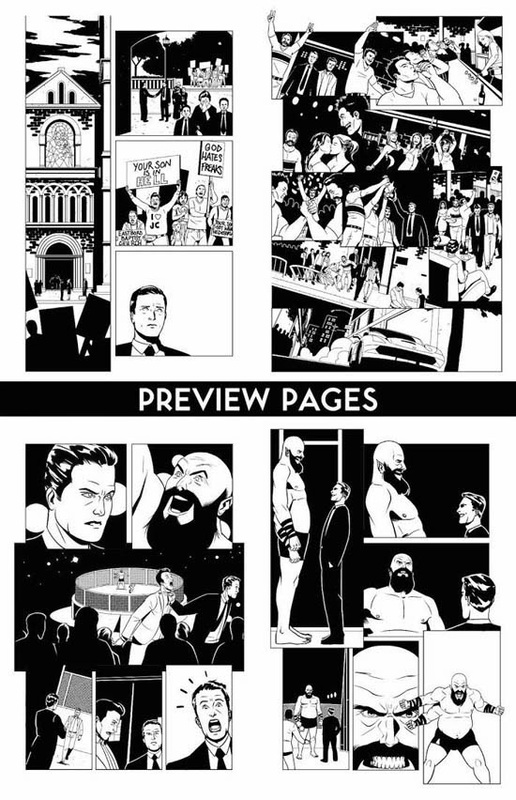 Readers who support the project can receive special editions of the first issue, copies of the complete four-issue story and even have the chance to appear in the comic as a supporting character, based on the amount they pledge. THE F1RST HERO: FIGHT FOR YOUR LIFE follows the adventures of JAKE ROTH, the only sane superhuman in a world where everyone else who has ever manifested powers has gone insane. These so-called "extrahumans" have been stripped of all their rights and are hunted down by the government because of the threat they pose to society. In this volume, Jake stumbles upon a mafia-controlled fight club whose three-armed extrahuman champion isn't afraid to kill his opponents for the twisted delight of his audience. That new extrahuman threat is ODINSON, the self-proclaimed "God of War". Odinson is loosely based on RAYMOND ROWE, one of the stars of the nationally-syndicated RING OF HONOR professional wrestling organization. FIGHT FOR YOUR LIFE is a sequel to Ruttgaizer’s critically acclaimed 2014 mini-series THE F1RST HERO: THE MONSTER. The upcoming series, just as the previous one was, will be published by the Pennsylvania-based ACTION LAB COMICS. Check out the Kickstarter Campaign Page or The F1RST Hero Facebook Page for more information on the fundraising campaign, the series or its creators or please contact sixteenhectares@gmail.com.